There is a lot of attention in the media being given to Blood Moons and we have received several emails asking whether William Branham said anything about this. 1 What is a Blood Moon? 2 Did William Branham refer to Blood Moons? 3 So what are we to make of the Blood Moons? A lunar eclipse occurs when the earth is between the sun and the moon and the shadow of the earth causes the moon to grow dark. The moon appears red during a total lunar eclipse. 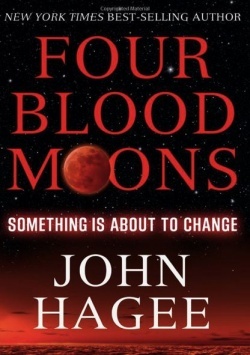 The term "Blood Moon" has no astronomical meaning but is a name used by the American evangelist, John Hagee, to bring attention to himself and sell the book he has written on the subject. Eight occurrences in 2,000 years is rare by anyone’s standards, but this recent tetrad is unprecedented. The parallels between the Catholic Church, Israel, United States, and the blood moons are simply extraordinary. God sent a prophet with the ministry of Elijah, to turn the hearts of the children back to the faith of the Pentecostal fathers. This ministry foreruns the Second Coming of Christ. Small groups of people in every nation on earth have accepted this ministry, and their faith is increasing every day by hearing the Voice of God. They will surely have their garments white, oil in their lamps, and be ready for His Second Coming. Did William Branham refer to Blood Moons? In 2014, the website of Voice of God Recordings promoted the "Blood Moon" issue. In 1956, William Branham correctly identified that Acts 2:15–21 clearly states that Joel 2:30-32 was fulfilled when Jesus died on Golgotha. Then in 1964, he states that Revelation 6:12-14 is fulfilled by prophets after the Rapture takes place. Slightly later, he refers to Matthew 24:29 and Mark 13:24–25 and indicates that they were being fulfilled in 1964 (see quotes below). As with most issues relating to prophecy, William Branham was completely confused on this issue and had no comprehensive theology on the phenomenon. He thought that the world was about to end and, therefore, his last references to the subject have him pointing to the end of the world taking place. He believed that this would happen by 1977. So what are we to make of the Blood Moons? Wise counsel be to not pay any attention to people that set dates or point to Blood Moons in the heavens as being prophetic. As Christians, we are called to proclaim the Gospel, help the poor, and give assistance to those less fortunate than ourselves. If you are working in the vineyard when the master returns, you will be rewarded. Those that are running around concerned about the when and not focused on the message of the Kingdom may not fair as well as those that have made themselves ready. The Jewish calendar is a lunar calendar. That means that their feasts and festivals always coincide with full moon events. It also means that lunar eclipses – which only occur when the moon is full – are not rare events in Jewish history. The lunar eclipse in 1492 wasn’t a “sign” of the expulsion of Jews from Spain. Why? Because the Tribunal that expelled them was established November 1, 1478 which occurred 15 years before the lunar eclipse. Hardly a sign or a warning is it? Plus, the Alhambra Decree, which officially ordered of expulsion of Jews from Spain, was issued in January 1492, which was about 15 months before the lunar eclipse that year. The 1948 eclipse is also not a sign of the Israeli war of independence. Why? Because that war began on May 15, 1948 and ended March 10, 1949. The first of the four lunar eclipses didn’t happen until just over a month after the war ended. Why would God give anyone a sign about something that had already taken place? That, by definition, is not a sign from God. The 1967 eclipse is not a sign of Israeli forces taking possession of the Old City of Jerusalem. Why not? Because that took place on June 7, 1967 and the lunar eclipse took place 44 days before that day, and – most importantly – it was not visible from Jerusalem. The next set of blood moons followed over the next year and a half. Again, after the fact. So, in what way are any of these “signs” of anything? It’s like someone shouting “Look out for that car!” an hour after your car accident. Most of these blood moon “signs” are not visible from Jerusalem, and/or occur long after the events have already taken place. Let’s be clear, nothing can truly be considered “a sign from God” unless a prophet of God speaks a prophecy – in advance of the event – and then the sign is given as a proof. That's the main problem that we have with William Branham - there are no real prophecies that we can find. Keep in mind: No prophecy preceded any of these events and no one gave these lunar eclipses and signs in advance as proofs. No one predicted that the Jews would be expelled from Spain before it happened, for example. So just because things happen, we can’t run around looking for signs after the fact. It doesn’t work that way. Here’s another point: Tetrads (or the occurrence of four consecutive lunar eclipses) are very common. They are not rare. They happen very, very often, in fact. Over the last 4,000 years there have been numerous lunar tetrads (or Blood Moons) on record, and between 1999 BC and today there have been 111 Blood Moons. Do you know what significant events coincided with all of those? Nothing. Because they happen all the time and are therefore not “signs” of anything happening in the world. It would be like pointing to the migration of Canada Geese as a sign of some political shift in China. The two events are not related, and one of those events (the migration of Canada Geese) happens every year about the same time, regardless of what’s happening in Chinese politics. Of the 55 Blood Moons that have occurred since the First Century AD, there have been 7 which coincided with Jewish Holy Days, and none of them were seen as signs of anything significant at the time. To put everything in another perspective, here are some very significant events in the history of the nation of Israel which DID NOT coincide with any Blood Moon signs. Guess what significant historic events happened during these Blood Moons? Wrong! Nothing happened. This is why Voice of God Recordings and John Hagee totally ignore these, because they can't point to anything that seems to support their bogus theory. Statistically, speaking, since Passover and the Feast of Tabernacles always happen on full moons, and take place on the 15th day of two different months within the year, there is a 1-in-6 chance that an eclipse will occur in at least one of these festivals annually. In the twentieth century, 37 of the 230 lunar eclipses fell on either Passover and Feast of Tabernacles, which is mildly fascinating, but completely irrelevant to anyone interested in Biblical prophecy. So, in conclusion, don’t waste your time – or your money – on anything related to this Blood Moon hoax. It’s designed to stir up fear, and loosen your wallet. Nothing more. Now, what if something significant DOES happen between now and the end of these four Blood Moon signs that are still forthcoming? Well, things happen all the time. My point is that if anything does happen in the world, we cannot point to the Blood Moons as any sort of prophetic sign. Enjoy the lunar eclipse. Take good pictures. Marvel at God’s creation. But don’t give in to the fear and the hype. The Blood Moons are not signs of anything other than the Glory of God as the Heavens declare His majesty and pour fourth speech all day long. “But in those days, after that tribulation, the sun will be darkened, and the moon will not give its light, and the stars will be falling from heaven, and the powers in the heavens will be shaken. When he opened the sixth seal, I looked, and behold, there was a great earthquake, and the sun became black as sackcloth, the full moon became like blood, and the stars of the sky fell to the earth as the fig tree sheds its winter fruit when shaken by a gale. The sky vanished like a scroll that is being rolled up, and every mountain and island was removed from its place. What happened? Signs and wonders took place. What happened? The moon begin to cry. The sun closed its eyes and begin to weep. And it went in such distress, till it had convulsions and turned like dripping blood. Sure it did. When it seen the Creator of heavens and earth refused by the earth, and so much sin He couldn't get into heaven and dying as a Mediator between God and man, stand between heavens and earth. The sun couldn't stand it, said, "I will not shine no more...?..." The stars, "I can't look at this." The earth said, "I can't stand it." And it had a nervous prostration and belched forth rocks out of the earth. Then miraculous took place...?... It was the end of the road. Sin had reigned until the cross, but sin was paid for there. Oh, my. The earth shook so hard till it throwed rocks out of its ground, a hung into the hills. Even shook so hard till the dead rose out of the grave. Talk about a nervous prostration... And the sun begin to have convulsions and went out. Miraculous took place (Hallelujah. ), always does at the junction. Do you get it now? There's your Seal. Who does it? It's the prophets the other side of the rapture. With the power of God, the Word of God, they just condemn nature. They can send earthquakes, turn the moon into blood, the sun can go down or anything at their command. Amen. I believe that we're at the hour of the Coming of the Lord. I believe that these earthquakes and things that we're having, this moon that they're... Up here at the observatory and things, they're watching this moon. It's squirting bloody-looking eruption from the inside of it. Jesus said that the moon would be turned into blood, and there'd be earthquakes all over the earth, in them--in them days before His Coming. He claimed that the day would be setting just exactly the way it is. Anyone knows that the world, positionally, everything is sitting in order for His Coming. "Earthquakes in divers places; the moon is spurting out red blood, or red volcanic all over, covering it," as Jesus said watch for that sign in the last days; "sea a roaring, men's hearts failing for fear, and perplexed of time, distress between the nations." ↑ The Holy Bible: English Standard Version (Wheaton: Standard Bible Society, 2001), Eze 32:7–8. ↑ The Holy Bible: English Standard Version (Wheaton: Standard Bible Society, 2001), Joe 2:30–32. ↑ The Holy Bible: English Standard Version (Wheaton: Standard Bible Society, 2001), Matthew 24:29. ↑ The Holy Bible: English Standard Version (Wheaton: Standard Bible Society, 2001), Mark 13:24–25. ↑ The Holy Bible: English Standard Version (Wheaton: Standard Bible Society, 2001), Acts 2:15–21. ↑ The Holy Bible: English Standard Version (Wheaton: Standard Bible Society, 2001), Re 6:12–14. ↑ The Holy Bible: English Standard Version (Wheaton: Standard Bible Society, 2001), Re 8:12. This page was last edited on 16 January 2016, at 06:11.